SHAWLIES, a play that is a joyous celebration of the heart and strength of the Cork Shawlie, when the legendary Coal Quay was at its most colourful and vibrant, will run at the Everyman Theatre, Cork, from Monday 1st October, for five performances only. SHAWLIES was written and is presented by Creative Collective Cork, a group of actor/writers. It is directed by Marion Wyatt who was responsible for such memorable hit shows as The Sunbeam Girls, The Good Sisters and Man of La Mancha. The play had a sell-out run at the Cork Arts Theatre over the Summer, and the expanded full length version of the play will now be staged at the Everyman. In SHAWLIES, we meet Lena Baxter, Queen of the Coal Quay. She kept the money she earned through selling goods at her stall in bundles stuffed into old shoes. Lena’s family, finding the bundles after her death, tell the stories of each shoe, and in doing so transport us to a bygone era in the history of the beautiful city. The play is performed by a large cast of Cork’s finest actors led my Antoinette Hilliard and Michael Murphy, and also features members of The Coal Quay Shawlies Group. 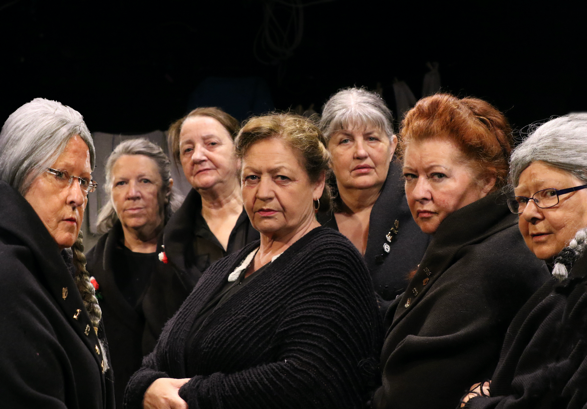 SHAWLIES is written by Regina Cooney, Antoinette Hilliard, Tess Healy Maguire, Rachel O’Connell, and Marion Wyatt, and is produced in association with Patrick Talbot Productions.